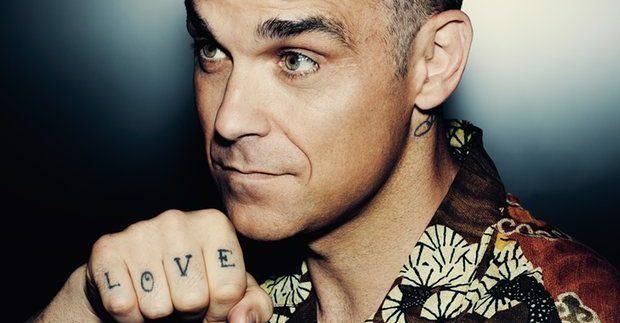 Three years after Swings Both Ways, Robbie Williams returns with his eleventh studio album, The Heavy Entertainment Show. Co-written with artists like Ed Sheeran, Rufus Wainwright and long-time collaborator, Guy Chambers, the standard edition of the album has 11 songs, while the deluxe edition comprises a total of 16, offering a heavy entertainment meal to Williams’ fans everywhere. As a man who has been in the business as a solo artist for almost 20 years, Williams has managed to establish a style of his own. However, his musical identity started to shake when he flirted with jazz in both of Swing When You’re Winning and Swings Both Ways. In this album, Williams not only regains his identity, he proudly flaunts it by offering a refurbished mish-mash of his old hits. With the same pace and style, ‘Party Like a Russian’ follows. Apart from being offensive to Russians due to certain allusions to a corrupted socio-political system, the whole construction of the conceptually-peculiar song is solid; taken from Prokofiev’s piece ‘Dance of the Knights,’ the serious nobility of the classical sample plays in contrast to the satirical lyrics, which talk about how lavishly a Russian aristocrat would party. The pompous sounds of the first two songs take a dramatic turn in the electro-alternative ‘Mixed Signals’, before mellowing in the second single ‘Love My Life’, whose lyrics shines a light over Williams’ new lifestyle as a happily-married man. And though the love ballad may be of a sentimental significance to the artist, its sappy lyrics and run-of-the-mill, 2000’s British pop sounds can only impress a teenage girl in love. Other romantic songs like ‘Marry Me’ and ‘When You know’ fare a lot better -especially the latter, in which pop is at its finest thanks to the effortlessly natural lyrics and the delicate string sample flowing throughout the song. From romance to the tough love of a father comes the alternative ‘Mother****er’, then rock & roll song, ‘Bruce Lee’, as mere fillers that offer little beneath their intriguing titles. However, Williams drifts from his usual style to surprise us with ‘Sensitive’, in which he successfully manages to surf the on-going popularity of electronic dance music without losing his distinctively warm voice by singing in falsetto. The same electronic vibe slows its pace in the pensive ‘Time on Earth’; featuring singer/songwriter, John Grant, the song has a strong resemblance to ‘Feel’ with its overall mood and backing vocals. Although Grant is overshadowed by Williams -both vocally and musically- in ‘Time on Earth’, he shines in ‘I Don’t Wanna Hurt You’, which is a Euro pop masterpiece; the choir backing vocals guide the steady disco rhythm to a dramatic orchestral peak that explodes in the last quarter of the song. Also featured on the album American singer/composer, Rufus Wainwright; ‘Hotel Crazy’ has a chilled swing feel and an effeminate air of an actress in a 1950’s musical. This last collaboration might not be a highlight in the album, but fares better than ‘Pretty Woman’ –co-written with Ed Sheeran- which happens to be the weakest of the collaborations -if not the worst song in the album; from the sexualized lyrics to the Spanish guitars playing in the background, the song is a bad copy of any of Ricky Martin’s 90’s hit songs. But Williams is inspired by none other but himself in ‘David’s Song’ and ‘Sensational’; while the first -the artist’s tribute to his late manager, David Enthoven – has the same musical style of ‘Angels’, the second resembles ‘Let Love be Your Energy’ in its uplifting rock mood. Williams unapologetically being himself is one the best things about The Heavy Entertainment Show; he knows who he is as an artist and where he stands in the ever-changing field of entertainment. The safe-played The Heavy Entertainment Show may not attract a new crowd, but it will definitely impress an avid Robbie Williams fan.